The objective of this tutorial is to describe a method to view the cross view stereo pair of the DAZ site galleries. A stereo pair is the two images take by a stereoscopic camera or two images generate in 3D modelling by two virtual cameras. This method was presented in an internet document by Jan Visser at the address http://slakje.jvnet.nl/3d/javimask.html . This tutorial simply illustrates the method with figures made in Poser. Yes, we can use Poser or DAZ Studio for teaching purpose. Cross viewing implies that your right eye see the left image and your left eye see the right image of a stereo pairs. In a cross viewing stereo pair, the left image is actually the image takes by the right camera and the right one by the left camera. The stereo mask is a method to facilitate cross viewing. 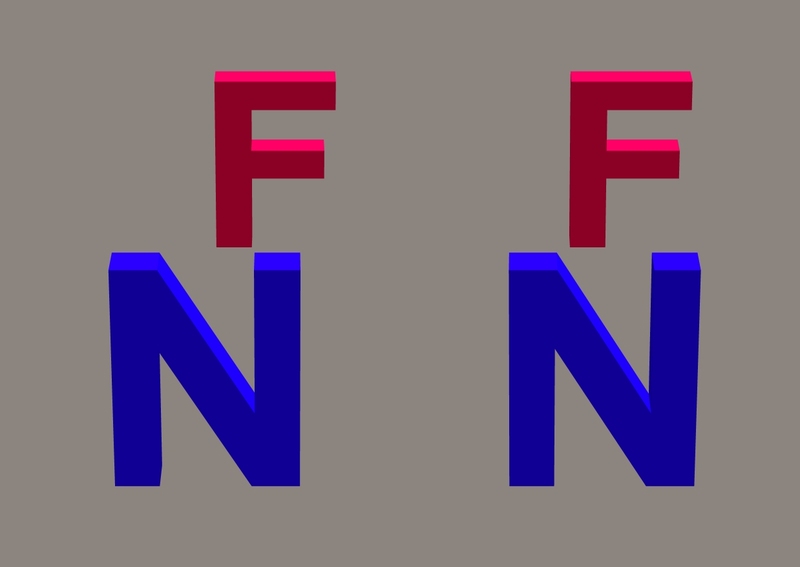 In order to practice the present method, you will find at the end of the tutorial a cross view stereo pair with the letter N (Near) and F (Far). If you success with the method, you will see that the N letter is in front of the letter F. The figure should cover most of the height of the computer screen. Take a rigid cardboard (a paper folder is OK) and cut, in the center, an opening of 2 inches (5 cm) width by 3.25 inches (8 cm) height. Place yourself at about 30 inches (75 cm) of the computer monitor and hold the mask at a distance of about 7 inches (17 cm) from your eyes. Close you left eye and move the mask left–right so that you will see only the left image with your right eye. Move the mask up-down to center vertically. Adjustments in the distance between you and the mask may be necessary. Do the same for the other eye. Close the right one and displace the mask to see only the right image by your left eye. You will probably loss the previous adjustments for the left eye. Do your best to fill correctly the mask opening by closing successively each eye. Holding the mask at the best position achieves in step 3, open the two eyes. Some persons will immediately see the stereoscopic effect, other will see two images. If it is your case, relax and lets your brain fuses the two images. If you have success in viewing the stereoscopic effect with the mask, it is possible to go further. Observe an image with the mask and without losing your concentration on the image, move slowly the mask downward. Three images will appear but stay tune on the middle one. If you see always the stereoscopic effect, you are now a free stereoscopic viewer and can enjoy many cross-view stereoscopic images on the net including those generate by 3D-modelling. Not able to see the stereoscopic image with the cross view mask, there is one final solution. It is the use of the parallel stereo pair to be view with a stereoscopic aid. In this case, the stereo pair should be parallel (The left image is the image takes by the left camera and the right image by the right camera). In a future tutorial, I will explain this method.